UPDATED: Thu., Oct. 15, 2015, 7:37 p.m. The Whitworth Pirates have successfully navigated every challenge thus far and head into weekend matchup against a Pacific Lutheran team that has been its nemesis of late. 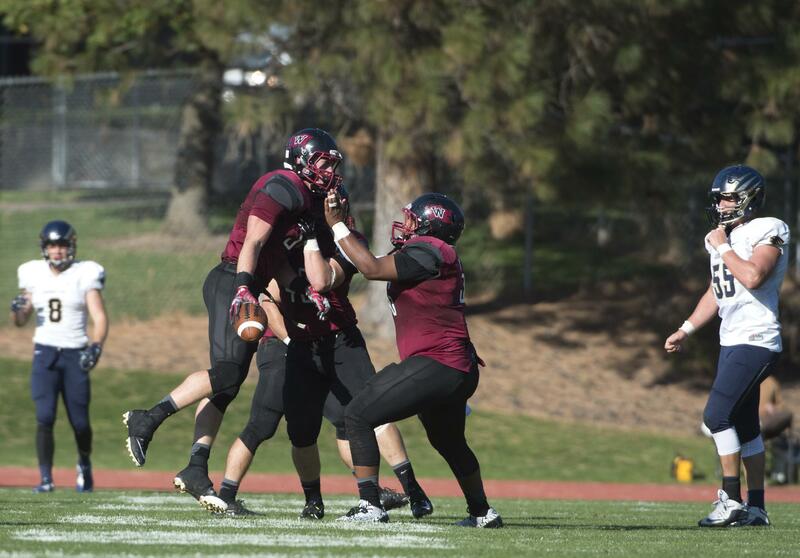 Whitworth (5-0, 2-0 NWC) has jumped all over its opponents with a high-octane offense that scores points in bunches. The Pirates hold a 127-10 advantage in scoring in the first half. But the team’s success largely has come from the emergence of a defense that ranks second nationally in NCAA Div. III in the number of sacks (5.4) and and turnover margin (+2.2) per game. “Football is not all one thing. It’s a lot of little things that fit together,” coach Rod Sandberg said. “We lead the conference in time of possession. On defense, we are deeper, fresher and we don’t have to be out there as long. But when that crew gets called, it has pillaged. The defense has forced 29 sacks and has recorded 50 tackles for loss. The squad is led in stops by a pair of outside linebackers who are converted defensive backs. Dalin McDonnell leads the team with 25 tackles and five interceptions. But he also has 3.5 tackles for loss and 1.5 sacks. On the other side, JT Phelan, who played safety and receiver at East Valley, has made 22 tackles. He also has an interception, 4.5 tackles for loss and 2.5 sacks. As with many players last year, both were pressed into action with a new defensive scheme that caused several heads to swim. With a second season to understand the concepts and some added depth, the defense is able to fly to the ball without players hesitating to think about assignments, said Adam Richbart, the defensive coordinator. Sandberg also credited the players with becoming comfortable with their assignments. He said the players trust their playmates to know where to be on any given play. A better understanding of the system has allowed coaches to move players to take advantage of their abilities. Phelan and McDonnell are prime examples. McDonnell, a 6-3, 208-pound junior, said the team focused this past spring on learning the defense. Phelan, a 6-2, 202-pound sophomore, said that added knowledge of the system has allowed the defense to play with more cohesion. Alan Stanfield, the offensive coordinator, said he’s more than happy to give sophomore quarterback Ian Kolste more chances to create points generated by the nine interceptions and eight fumbles recovered by the defense. “That gives us a short field to score. They are playing with a lot more confidence, for sure,” Stanfield said of the defenders. But the team faces a tough test against the Lutes (0-4, 0-2), which has beaten the Pirates the last five seasons. Published: Oct. 15, 2015, 1:34 p.m. Updated: Oct. 15, 2015, 7:37 p.m.